Use as a cooling rack or baking rack- the choice is yours! With solid stainless steel construction and no artificial coatings or treatments, these baking racks are 100% oven safe. Perfect for oven baked bacon and chicken wings or as a cake or cookie cooling rack. The perfect size! Great for compact kitchens, toaster ovens and RV's, or just when you're not baking for a crowd, each rack measures 8" x 11 ¾" to fit inside a standard 9 ½" x 13" quarter sheet pan or jelly roll pan, leaving enough space to easily insert and remove without spoiling your meal. Alternatively, use both racks together inside a half sheet baking pan or cookie sheet to elevate and cook, broil or grill ribs, meat or fried food. Sick of flimsy racks that warp and twist? These 100% stainless steel cooling racks are designed for maximum strength and durability, and to resist warping and wobbling. 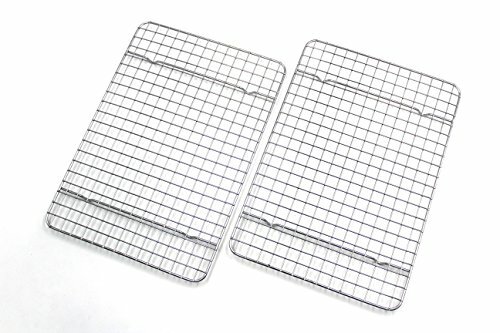 No more cookies sliding through the gaps on this wire cooling rack! Our perfectly spaced crosswire mesh grid pattern optimises airflow and prevents your treats from falling through. Great for cookies, cupcakes, muffins, bread, cakes and more! Clean up is a breeze! Dishwasher safe! Every bakers dream - just like our best selling half sheet cooling racks, these quarter sheet racks can be safely washed in the dishwasher without corrosion or rust. Whether it's cooking, cooling, baking, drying, broiling or grilling, you'll find so many uses for these handy heavy duty cooling racks!